It’s been a year since I started working at Frappe and its about time for some introspection. This isn’t going to be a tech blog or so, but instead would portray what it’s like to work at Frappe. What is it like working at Frappe — interesting, surprising, fun, inspiring, etc are just the beginning of it. So the first thing to strike off the list would be to tell you what Frappe is. In laymen terms, Frappe is that magical framework whose existence if you’d have had known earlier then nailing college projects would have been as easy as snapping fingers. Its a Full Stack Web Framework, much like Django or Flask but unlike them at so many levels. The difference lies in the fact that Frappe provides a ton load of features out of the box — more connectors, integrations, lot of libraries, multi-tenant setup, REST api, etc. So if you want to build an application packed with lot of features, Frappe can get you started much quicker than the other frameworks. I didn’t have any experience to work at a company probably because I wasn’t keen on working as an intern during college time or the fact that I wasn’t planning to start working right after the college at all. Got to know about the company from a friend, saw their website that stated ‘hiring now’ and I couldn’t stop myself from applying. One thing led to another and two weeks later I was there, beginning a new journey of my life. I went to work there with my own expectations on what it’d be like and what’d I end up doing. Before I get any further I want to mention that I work here as a Software developer. The best part about working here is that there’s no hierarchy of roles. Everyone shares the same title, a developer. The kind of it may be different but the work is same — enhance, improve, improvise and fix. Better known as Open Day where each of us get to present what we’ve worked on in the last month. The presentation is followed by lunch - we either go out for it or we have it delivered at office. A lot of conversation takes place over the lunch. This is usually followed by another round of discussion about the roadmap and how to move forward as a Company as well as an Individual. A lot of ground breaking decisions have taken place during this time. Frappe has its own ecosystem — that’s right! There’s a whole community around Frappe and its flagship product ERPNext — open source ERP. The community gets to involve in the decision that are taken and the roadmap of how to move ahead. The community can also contribute in many ways that benefits them and the company at the same time. “You want a feature ? — develop it or get it developed, send a pr on Github, have it reviewed and make it available for everyone”. ERPNext also drives a foundation which is a collective convergence of different community members. I mention this because I am one of the developers that was hired through it — so kudos to the brilliant idea. There are lot of group activities that we venture upon. Be it going for lunch or movie or maker’s fest or so much more. There’s Xbox that was played for a long time. Currently, its the Bombsquad era — played mostly on Friday every week. 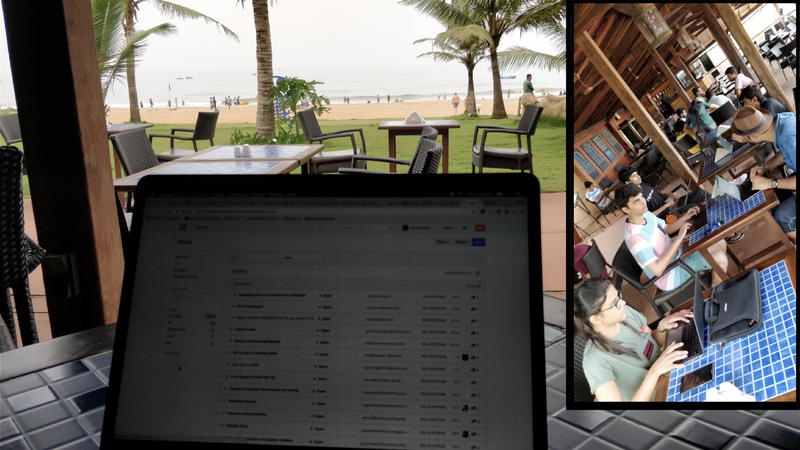 There was also that one successful Goa trip — and it’s worth remembering because we were there, by the beach side with our laptops answering to support queries whose count went berserk. There’s energy and positive vibes in everyone. There are code sprints taking place in office to collectively tackle something. There are meet-ups where people whose life is touched by Frappe come along to see what’s happening and what they’d be seeing in the upcoming versions. 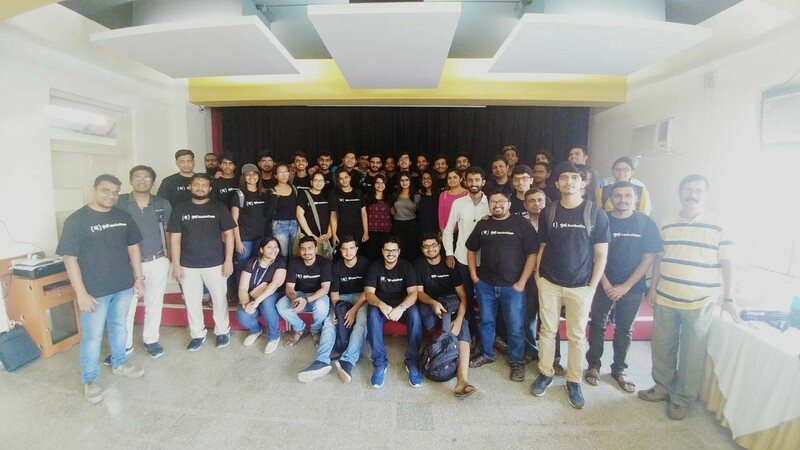 Then there’s Hackathon every year organised by Frappe to challenge young budding tech-enthusiastic students to come up with their team and develop something in a limited span of time. The winner obviously takes a huge sum of money but what they all take in common is an experience — experience to work in a team, to work towards a goal, to create an impact. There’s also a great initiative taken this year - “ESOC” (ERPNext Summer of Code), a direct spinoff of GSOC (Google Summer of Code). Engineering students are working as interns in this 3 months program to help us develop some new and exciting stuff and at the same time gain experience and knowledge for their own-self. It’s really amazing because each of these individuals brings a different set of ideas on the table and working as a team, they get to evolve and enhance their own skills. Lastly, there’s also a conference held every year to bring together the community members, build up networking and discuss the happenings of the last one year and what should be done in the coming year. This is perhaps one of the best things. I remember reading somewhere - “You’re no good of a developer or coder, if what you invent is not going to be helpful to others”. Frappe might not be as big of a company (yet) but it still has a huge user base and anything you work on will probably touch hundreds of people or maybe multiple times that. Its such a great thrill to see your work go live and in the hands of so many people. Something that was maybe just in your head or was requested upon by someone, is now a reality and in use by hundreds. There’s also that gratification when you get to learn that someone is using that feature of yours and in your head you’re like (that’s mine! that’s mine!). There’s also the thrill when you realise that something that you created takes out a tiny portion of stress, out from a user’s life, makes data a tiny bit easier to understand, makes a difference in a user’s experience. Hence, the scale at which you can touch people and make a tiny bit of difference for someone is huge at Frappe. And because of the open source nature, you can correct something in the product and have it quickly reviewed and reflected in the product in no time. The one when we were working with a beach view. That’s right! There’s complete freedom of work at Frappe. Freedom in the sense that you get to decide what you want to work on. Also freedom from where you want to work — there’s no one forcing you to come down to office everyday or anyone keeping an eye on you or your attendance (biometric or manual). You can come to office anytime you want or work from home. Great ideas can come to you at anytime and mostly when you’re at peace in your comfort zone which can be your home or a cafe or any place for that matter. Not having to worry about being in office at 10 or so, is a relief. Although a great initiative, its something that you shouldn’t take advantage of. Because no one might look over you to see what you’re working on every time but at the end of the month, you’ve to present yourselves and you have to make sure that what you’ve done is substantial and has really made an impact. It’s you who should look out to your ownself and thrive to be better than what you were last month. Frappe is somewhat 10 years old and it has only just begun to mark its impact out there in the world. At any given point in those years, it was run by max-to-max 20 employees. It’s really astounding what the people and the company has accomplished so far. It faces many challenges and its rapidly evolving on the go and only time will tell the greatness the company will unlock.